Not just a scrub store. With full service uniform stores, custom uniforms, embroidery, and mobile uniform units, Ward Apparel is the #1 place to outfit your entire staff. Need uniforms? Talk to us. We represent over 140 brands in medical garments, police & fire, professional wear, school uniforms, workwear including FR, sports wear and spiritwear and much more. Our embroidery, screen printing and sublimation services provide cost effective group branding whether it’s your office or little league team, we have a solution. We’d love to help you outfit your entire staff. We offer custom embroidery, screenprinting, customizable school programs, fund raising help, payroll deductions and a full retail store. We offer private ecommerce sites for many of our customers to support their uniforming programs. 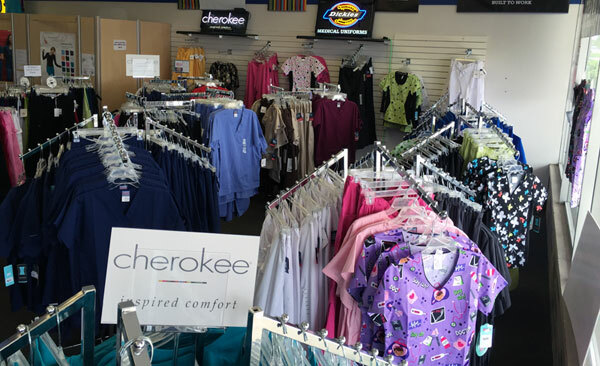 We offer your employees the convenience of shopping at work by bringing the store to your facility! Click here to see how you can have a full store of custom embroidered apparel, delivered right to your facility. Our Management Team has over 28 years of combined experience working with the top nursing schools in North America. We understand your group’s unique needs and can provide customer service to all your locations that’s second to none. Above all else, we realize the importance of on time delivery. We will bring our store to your workplace! 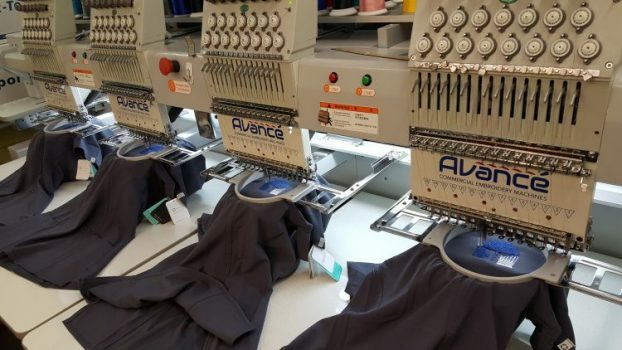 We’ll help you design custom logos & embroidery, select apparel, and then bring all clothing options to your facility for employees to get fitted in on-site. This saves you both time and money. Schedule a mobile uniform show or find out more today! Not just a scrub store! WARD Apparel offers all the top brands at awesome prices! Want to try something different? Our knowledgeable staff can help you find your perfect next set of scrubs and you can always try before you buy. Career College / Student Programs. WARD Apparel’s staff has worked with Career College nursing and other programs ranging from single to hundreds of locations throughout North America. We understand the challenges of providing embroidered uniforms to students in a timely and cost effective manner. Why WARD Apparel for your school? Brand Name uniforms from Cherokee, Dickies, Barco, Landau to ensure quality, professional appearance and on time delivery. Customized / Private Student ordering websites. Custom reporting and billing to fulfill individual and group location requirements. Package Per Student and other services to make issuing uniforms simple and accountable. Custom kitting per each classes needs. Customer service that is second to none. We believe in making results, not excuses. We can work with you to for compliance with brand standards or simply in creating your own image. Your staff will look professional and sharp with everyone looking uniformly excellent. We will work with you to establish the uniform program for your organization. This can include color coding for job roles, custom embroidery, screen printing or sublimation. For onsite events we offer Cash, Check, Credit Card and Company Credit, Payroll Deduct or Vouchers (if authorized by host facililty). Our state-of-the-art POS systems help us have fast checkout times and quick special ordering. Realtime warehouse inventory counts and customer-friendly Special Order Systems ensure that your staff buys exactly what they want. For online ordering and in store, company credit accounts, payroll deduct and voucher programs can be setup if desired to allow your staff to order authorized product (in addition to all normal payment methods). Contact us for any of your uniform and apparel needs! We’re here to serve. Let us know if you have any questions! We look forward to working with you.